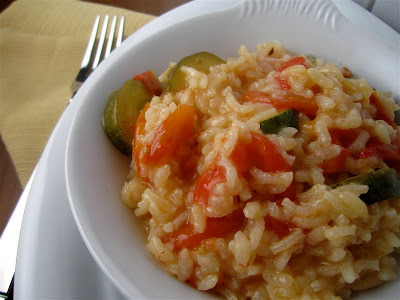 Risotto isn't something I typically think of as a summer dish. It's cheesy rice, which to me says "heavy", which in turn screams winter or fall. Yet lately I've been dreaming of risotto. There's some therapeutic about making risotto, pouring the broth into the rice, watching it absorb, adding more broth, etc. It takes awhile but it's so easy that it's almost mindless. 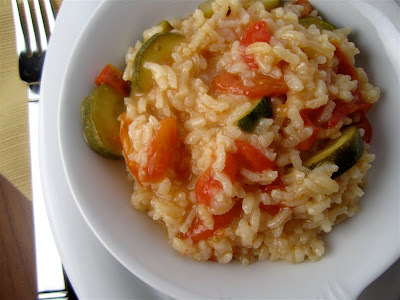 This risotto recipe was really lovely. The tomatoes popped, releasing a lot of their juice into the risotto. This made it lighter and bit more summery. I used tomatoes and zucchini, but if you have a plentiful garden you could add whatever you have on hand. Also, I roasted my veggies because I'm a fan of the affect roasting has on vegetables, but if you don't want to heat up your kitchen you can easily just cook them in a pan. The flavor of this was excellent with a nice tomato/cheese harmony. I am excited about the leftover risotto, I will be turning it into risotto cakes for lunch tomorrow and I'm already psyched to do it! 1- Preheat the oven to 350. In a small dish toss the tomatoes and zucchini together. Drizzle olive oil over the mixture, season with salt and garlic powder. Bake for 45 minutes or so. 2- Meanwhile, bring the broth to a boil and lower the heat to a simmer. 3- In a large skillet, heat the 1 tsp olive oil and add the onion. Once it's hot, add the rice and stir well. Once it begins to lightly toast, add 1 cup of broth and lower the heat to medium/low. Allow the rice to absorb the broth. Once it's absorbed, add another cup. Continue until all broth is added. 4- When the last cup of broth is cooking with the rice, remove the veggies from the oven and stir into the rice mixture. Add the cheese, stirring well. Season with salt and pepper. 5- Allow to continue cooking until most of the liquid is absorbed. Serve hot. This looks great! I want to try this and have TONS of tomatoes that need to be eaten soon before they go bad - win win! I love risotto and I love roasted tomatoes...you have created the perfect dish for me :) My Italian MIL will be pleased too!